The Find Database tool is used to find an eForms database from the current or previous years when its definite location is no longer known. The year of the database being located is displayed as . "T##" at the top left of the Find Database screen. eForms databases are in the format User Specified Name.T##N where ## indicates the final two digits of the year to which the database applies. 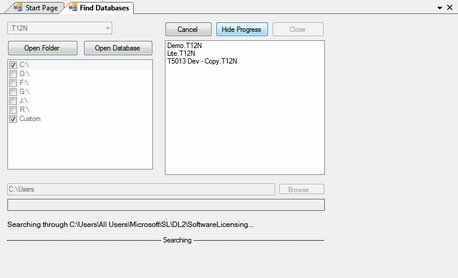 The Find Database tool will search all selected drives and storage locations to find databases for the specified year. If "Custom" is selected as a search location, the "Browse" button at the bottom of the screen becomes active. This will allow you to indicate a specific folder where the Find Database tool will begin to search and letting you avoid searching entire hard disks when some idea of the database's location is known.